This volume providesnew conceptual insights, robust empirical studies, and thought-provokingchapters to help organizations improve health and wellbeing insociety. 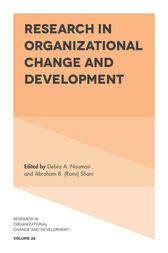 Some chapters dothis by addressing macro-level change: for example, consulting at the eco-system level anddiscussing the challenges entailed in developing intervention capabilities toimpact highly interdependent eco-systems; or discussing the learning and experience of a large system transformation projectconducted at a national level that had an impact on societal health andwellbeing. Other chapters extendtheory and integrate perspectives that heretofore have remained separate, suchas the 2017 Pasmore-Woodman Award winners, who provide an overview of theircollaborative attempts at intervening and making a difference in organization studies. The richness of the diverse collaborative contributions to thisvolume by leading scholars and scholar-practitioners from around the globeprovide an enriching and emerging body of knowledge. Debra A. Noumair is a Professor in Social-OrganizationalPsychology, and Founder and Director of the Executive Master’s Program inChange Leadership, at Teachers College, Columbia University, USA. She is alsothe co-author of OrganizationDevelopment: A Process of Learning and Changing, co-editor of Group Dynamics, Organizational Irrationality,and Social Complexity: Group Relations Reader 3, and Associate Editor of The Journal of Applied Behavioral Science. Abraham B. (Rami) Shani is a Professor atthe Orfalea College of Business, California Polytechnic State University, USA,and a Visiting Professor at the School of Management, Politecnico di Milano,Italy. He is the author or editor of over 32 volumes and books and more than120 articles in the areas of organization change and development, collaborativeresearch methodologies, learning in and by organizations, sustainability, andsustainable effectiveness.